Hi Leo, thanks for taking the time to talk with us. Let’s start at the beginning, could you briefly tell us how your drumming career began? I started the ‘usual way’ by getting together a collection of pots and pans, and making a lot of unpleasant noise. When I was born, my grandparent’s first gift to me was a toy drum. After that, my sister Anna, and I always wanted to be in a band after listening to my dad’s records. (we were 6 or 7), we used to put on little concerts for my parents friends when they came to dinner (whether they liked it or not! ), her on guitar, me on ‘drums’ (boxes, pan lids, etc). After that my parents bought me a drumkit when I was 12. I was fortunate enough to grow up in the country, and so there was no problem with disturbing the neighbours. From there I kept on going. Did you have and sort of lessons or tuition, and if so please elaborate on who you went to, and how long etc, Also, what do you feel is the most important thing you learnt during your tuition, if you had? My Parents sent my sister and I to a very musically orientated school, there was an orchestra, jazz band, big band etc, all of which we were encouraged to became a part of. The school also employed a ‘drum kit’ teacher, which was quite unusual, the only tuition up until then was ‘snare drum rudiments’ which was not particularly interesting to me. The teacher (who is still a good friend) Sam Anstice-Brown, taught me to listen to a great variety of music (even if it’s not to your particular taste) and learn from it. The most important thing I learnt from tuition (apart from basic rudiments) is to keep your ears open – even if you don’t like a genre of music, there may be something to be learnt from it. Playing with The Prodigy is a great example of this. Liam draws from so many genres of music (be it Old school breaks, or recent film scores). There is always something to be found everywhere if you can keep your ears open. Never restrict yourself to one ‘type’ of music. Do you, personally have any sort of structured practice routine, and if so, please share it with us? These days, not so much. But when I was really trying to develop my technique I used to start with paradiddles, and basic rudiments played around the kit. Splitting hands with feet, and trying to play double stroke rolls, particularly on the lower toms, where the tension doesn’t allow for much bounce. A good trick Sam taught me was to practice rudiments on a jumper, or pillow, something that doesn’t allow you the luxury of ‘bounce’ like a snare drum would… That way your hands become much more precise, and you’ll find, that after a few weeks of practicing on the pillow you can play double stroke rolls everywhere around the kit easily! What do you do when you’re not on the road, or drumming? I actually have another job: I work for a company in the UK called ‘Headstock Distribution’. I look after the ‘Artist Relations’ (managing artist endorsements) for them, which includes LANEY amps worldwide, TAMA drums and IBANEZ guitars in the UK. Headstock has been really cool with me joining the band, and I’m lucky enough to be able to do both jobs concurrently. Both sides of the fence you might say! I have always listened to a variety of music. I love the ‘old school’ band session guys. Bernard Purdie, Clyde Stubblefield, basically the guys that made modern music what it is. Equally, I personally learnt a lot from the ’90s jazz/ fusion guys like Dennis Chambers and Dave Weckl, they have perfect technique. I love the performance of rock/metal guys such as Lars and Dave Grohl. For me the epitome of modern technique and musicality can be found with Brann Dailor, Danny Carey and Gavin Harrison. But, at the same time I love the grooves laid down by Clive Deamer and Jeremy Stacey. Tell us about how you got involved with “The Prodigy”? I actually met the previous drummer for the band (Kieron Pepper) when I was working as a drum teacher in Birmingham while at Uni. We got on well, and stayed in contact. When I got the job working for TAMA in the UK, he was the first person I called, I wanted the Prodigy to use TAMA! When he left the band, he called me and told me there was a job going, after that I made a tape on a friend’s video camera of me playing to some Prodigy tunes and sent it to the band, and they called me up for an audition. I did that (which was the most unnerving few hours of my life to be honest!) and then they asked me to play a show with them in Poland that New Years Eve. From then we did some more shows, and I guess the rest is history. You seem to be on the road quite a lot since joining “The Prodigy”, what has been one of your highlights while performing with the group thus far? For me playing shows in places I never even dreamed of going is quite a buzz. A stadium in Japan, an arena in Rio De Janeiro, it’s incredible to get to these places I would not have seen otherwise. Equally, playing the venues in which I used to go see my favourite bands (like Wembley arena – I went to see KORN there when I was 16!) and later this summer we play Milton Keynes Bowl (where I went to see my ‘proper’ gig ever – monsters of Rock – Metallica) Equally, playing Glastonbury festival, near to where I grew up was a massive buzz. I grew up wanting a ticket, now I am playing the closing night! How would you describe your drumming style in just five words? Furious, dedicated, technical, dynamic, sweaty. Touring the Prodigy’s 7th, 8th Studio Albums. Tell us about the gear you use? 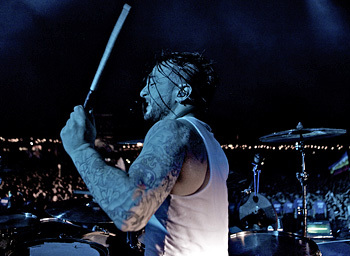 I use, have and always will use TAMA drums, when I first started I used to play other brands (whatever was at hand! ), but to be honest, they could not stand up to the battering they received, nor, in my experience did they sound that good. TAMA drums, particularly the Starclassic Maple and Bubinga range consistently sound fantastic. People say to me ‘well you work for TAMA so you have to use their drums’. I don’t HAVE to use anything, with The Prodigy I can always choose, but in my time teaching and working at drum stores I have tried pretty much every brand there is. I have not yet found a brand that can produce drums that sound superior, and can be relied upon on the road to the degree that TAMA can. I rely on TAMA totally, and I’m always supported with the drums I use (Bubinga Elite), and whenever I need anything worldwide, TAMA have never let me down. I use Zildjian cymbals for the same reason. Not only do they stand up to the abuse I give them, they sound amazing (our FOH guy – Jon Burton, loves the china trashes!). The new Z3 range is a great balance between the Z Custom (always a little too heavy for my liking) and the A Custom range. Zildjian make great products, and they are superb at supporting us wherever we are. If I break a cymbal on the other side of the world, I know that I can get another the next day. That is really important when you are on the road, and they consistently sound excellent. I will only use Vic Firth X5Bs and Remo heads. Ambassadors for toms and Emperor Xs for snares. They take a beating. The UK music/drum scene is much bigger than that of say, South Africa’s, just how hard is it to get on a high profile gig? Also, what advice could you share with drummers looking to audition for bigger bands? I was fortunate enough to be ‘in the right place at the right time’ in this instance, but I have never been complacent. Surround yourself with music, and people that are passionate about music and you surely can’t go far wrong. High profile or not, if you are happy doing what you do, you can’t lose. We recently added an Up and Coming section to our site what advice would you offer, up and coming drummers/musicians on practicing? No matter what your friends think, listen to, and try to appreciate as much music as you can… you can learn something everywhere, be that a ‘top 10′ programmed beat on a Lady Gaga track or black metal 32nd bass drums from Dimmu Borgir! Closed ears are deaf ears. Create your own style and don’t think you have to stick to one genre to succeed. Check out : www.theprodigy.com for tour news. Also ACS in ear monitors, (http://www.hearingprotection.co.uk/), on which I rely nightly. The best in-ear-monitors, period.